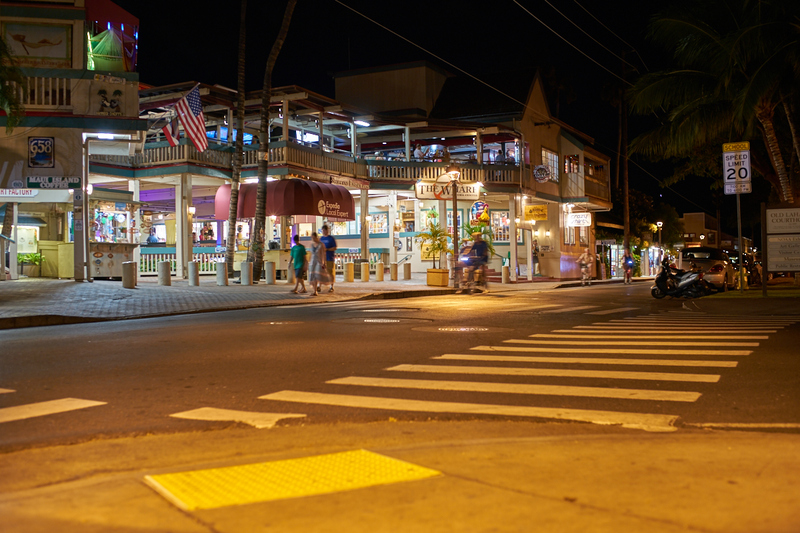 For dinner the previous evening we went into Lahaina. Parking was a nightmare, but we prevailed. 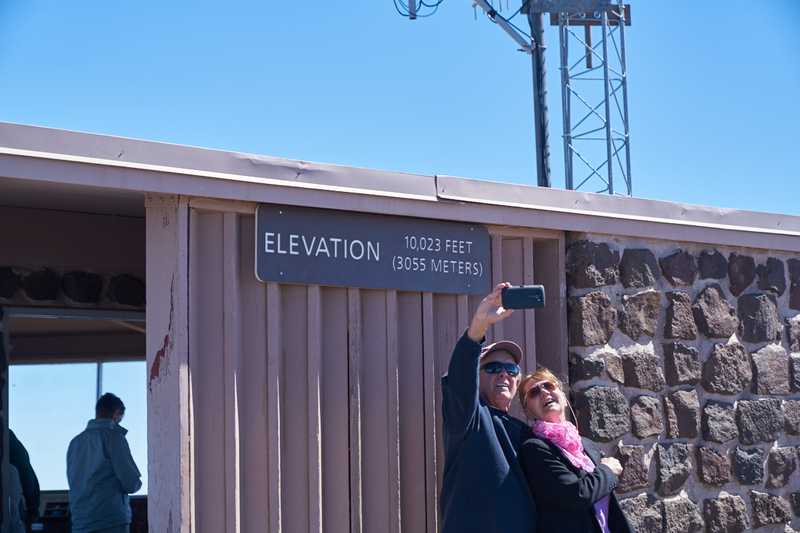 The next morning, our destination was Haleakala Crater. 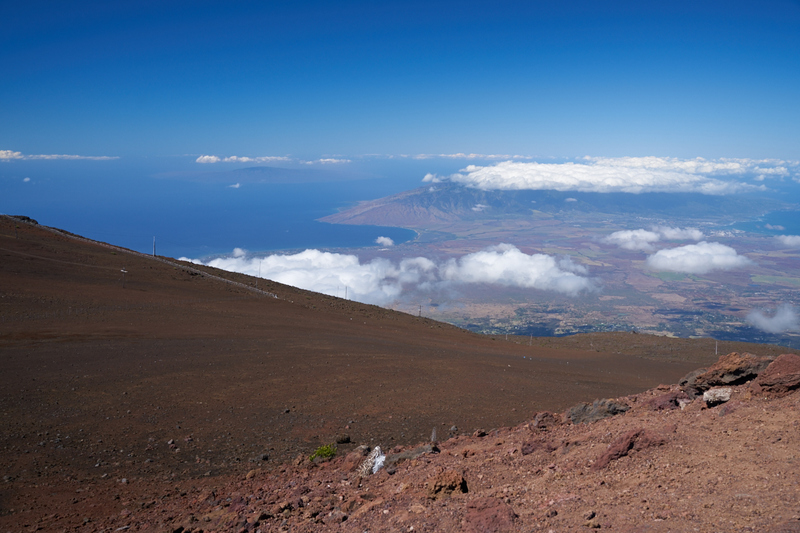 At 10,000 feet, it is the highest peak on the island of Maui and the second highest peak in the Hawaiian island chain. 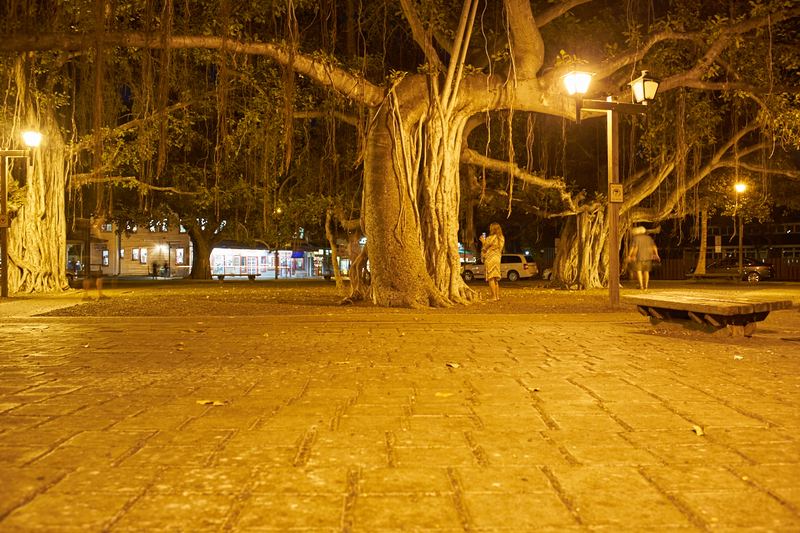 The plaza in Lahaina had a huge Banyon tree that had taken over the whole area. All of the trunks visible are the same tree. While this photo might cause you to believe otherwise, the area was quite crowded. Most of the people were north of where this photo was taken. The next morning as we were driving toward Haleakala I spotted this Coast Guard helo hovering over the water. It appeared to be either a rescue operation in progress or a training mission. Note the spray from the rotor wash. He hovered for quite awhile as we drove past the bay. While the photo above is not pristine in quality, it was shot from a moving vehicle at 60 mph. 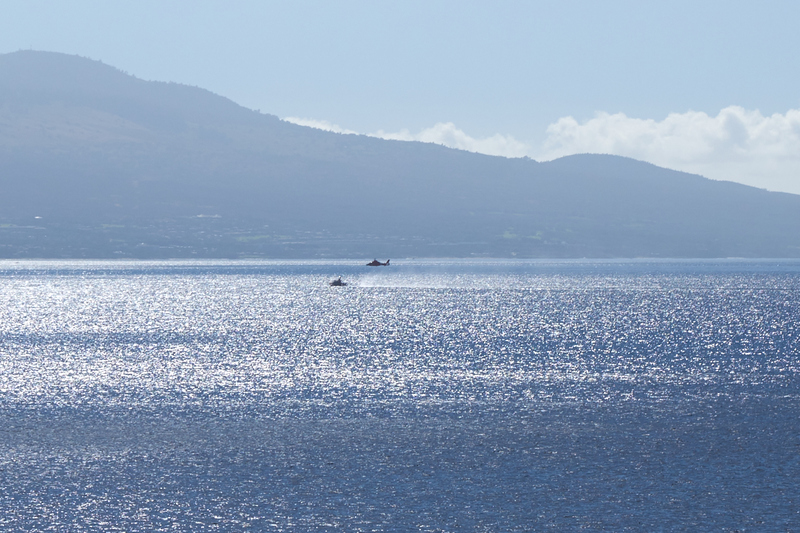 This is a crop of a zoom at 70mm. 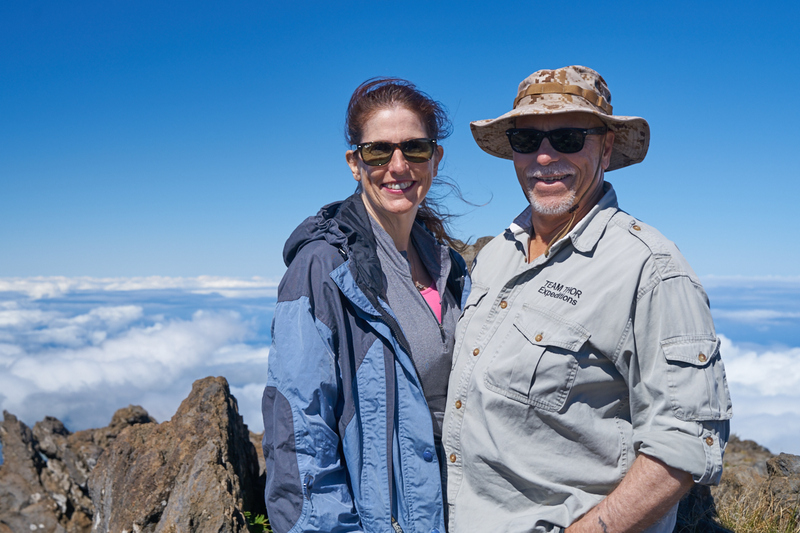 About half way up the face of Haleakala we were rewarded with a nice view of the other volcanic peak on Maui. The wind farm on the west flanks is in use nearly every day due to the prevailing trade winds. 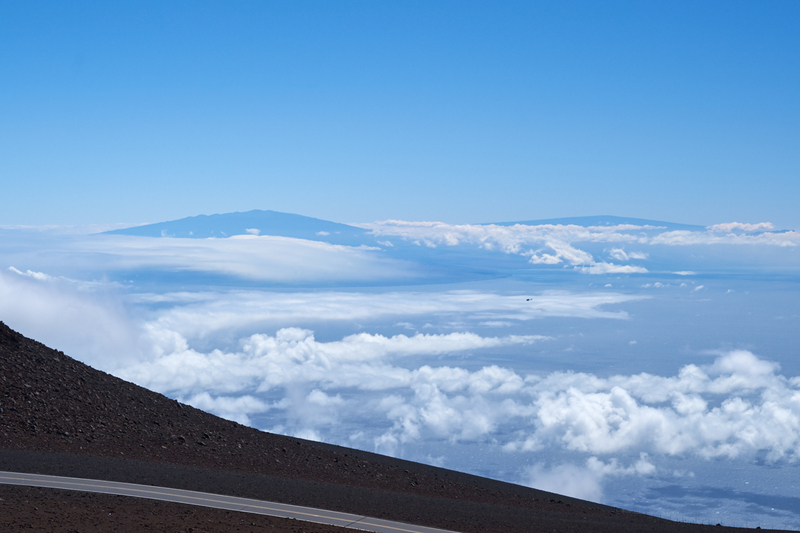 The winds cause the clouds to form on the windward side of the mountain. From the peak at the overlook we got a better view to the northwest. 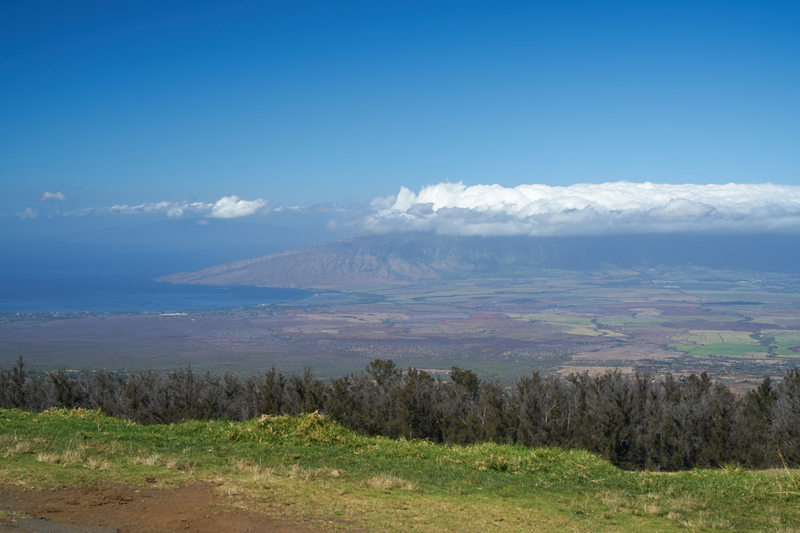 Visible in the distance is the island of Molokai. In the foreground is the harsh volcanic rock ejected from the crater. 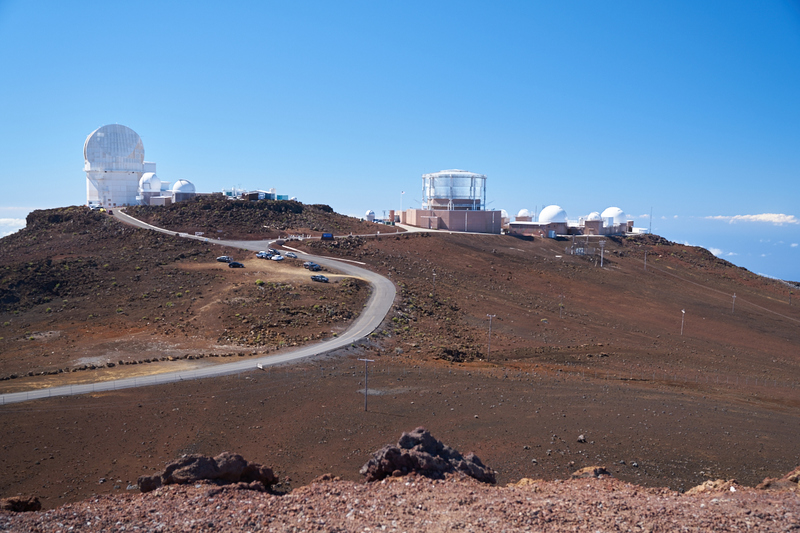 From the peak we could see the telescope array. These instruments are operated by the government for various purposes. The can-shaped structure is a special device used to track space junk. This information is used to predict object paths with the hope of avoiding collisions. To the south we could see a helicopter and in the distance two other islands. I assembled a panorama from the overlook at the peak. The wind was howling at 40mph with even faster gusts. 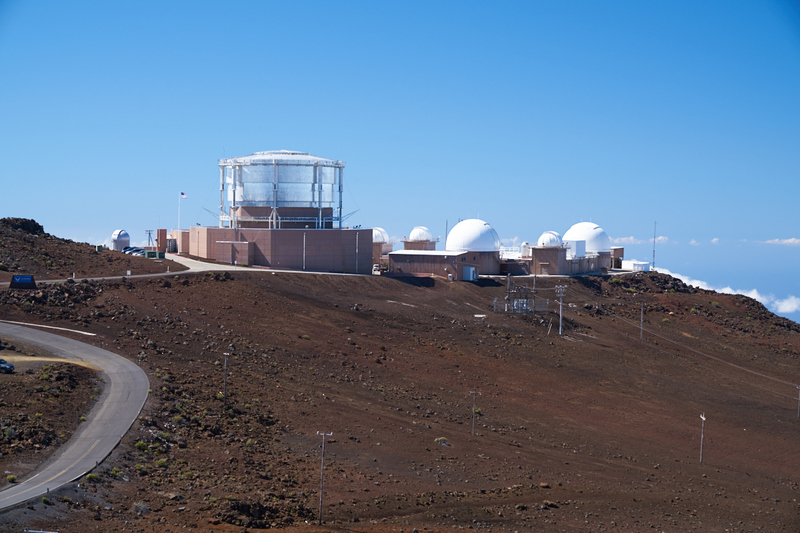 The visitor's center is on the left and the central portion of Haleakala Crater is in the center. The sign tells the story. This couple was on the lee side of the building making standing outside acceptable. I can assure you that the windward side was not acceptable. The strong winds were not just blowing dust but gravel and small stones and pelted me as I was attempting to take photos. 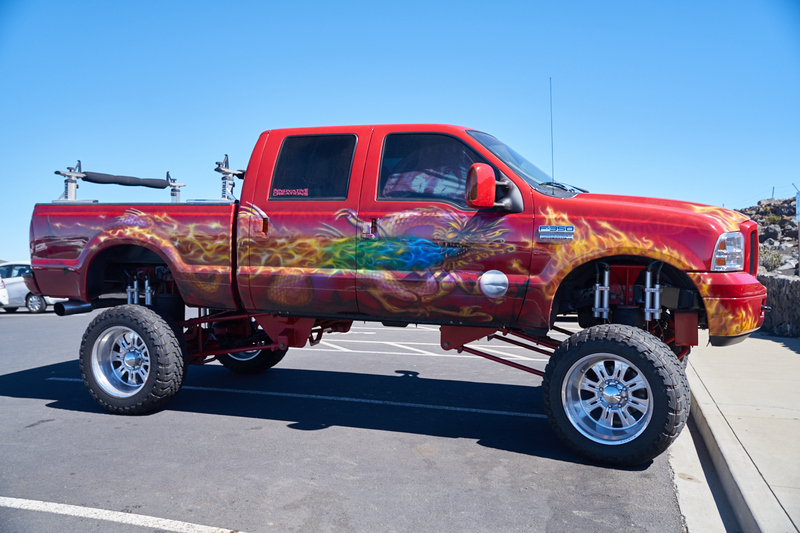 Everyone has their own opinion about "lifted" trucks, but independent of your personal opinion, you will clearly agree that the paint job on this rig is first class. To be sure, with this kind of paint, this truck will never be on any trail where the is a risk of brush scratches. This panorama is centered looking east. Note the blanket of clouds. At the altitude of the peak, most of the weather is usually below you. 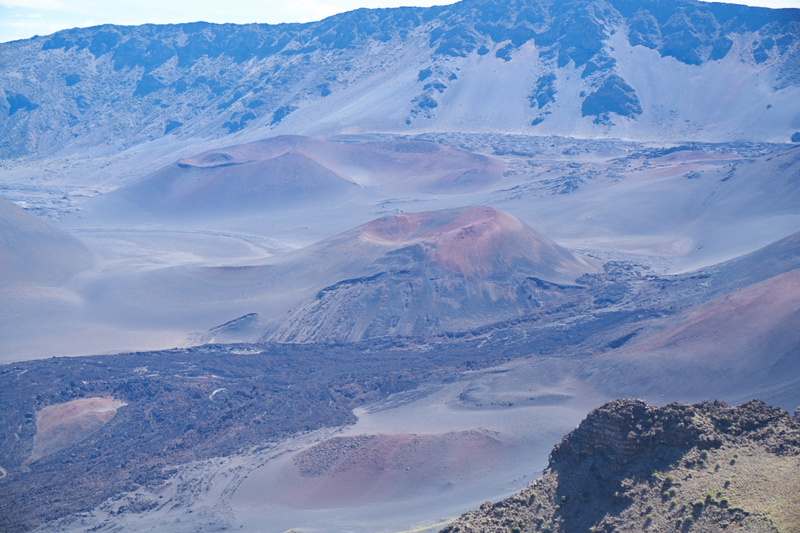 Taken from a different overlook, the panorama above clearly shows the dark brown lava flow that came from the volcanic vent at the right of the photo above. 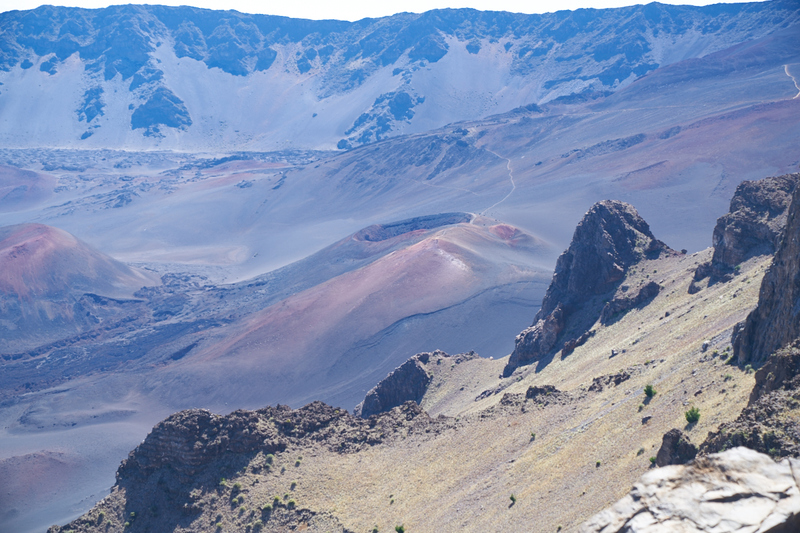 Looking into the crater, the cinder cones are clearly visible as are the hiking trails that allow tourists to get to the cones. In addition to showing the source of the lava flow, the photo above shows that there has been slumping on the sides of the main cinder cone. Stephanie was nice enough to take a photo of Kathleen and I at the peak. 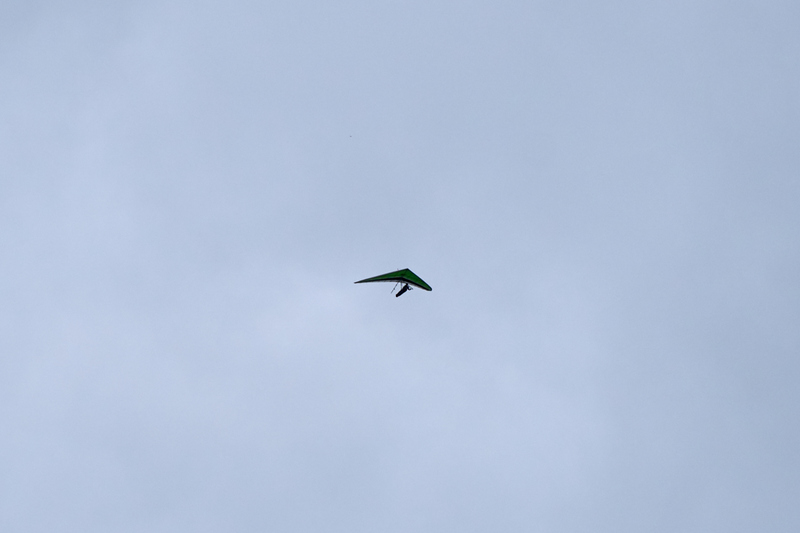 As we descended from the top, we spotted a hing glider above us. This fellow was launching as we were going up the hill at about 9,000 feet elevation, so at this point he must have been in the air for at least 45 minutes, maybe more. The winds near the top were really strong. 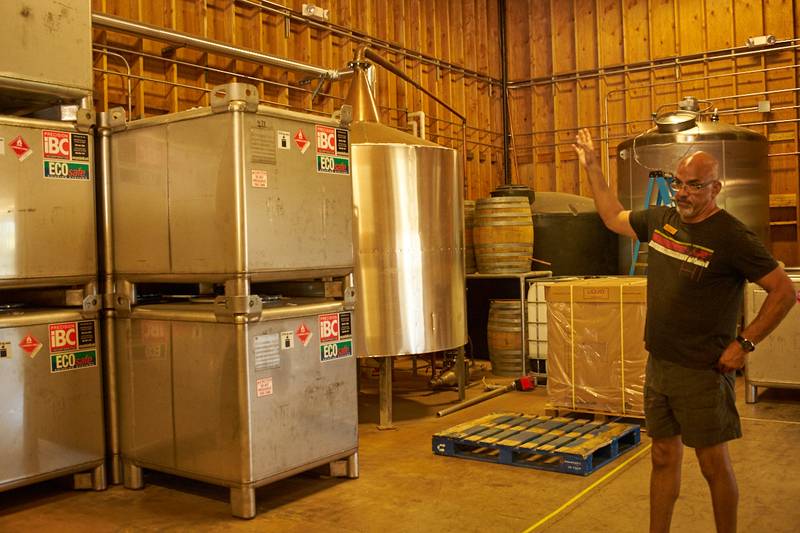 Kathleen was driving, so when we finished with Haleakala, she drove to the Ocean Distillery for a tour. 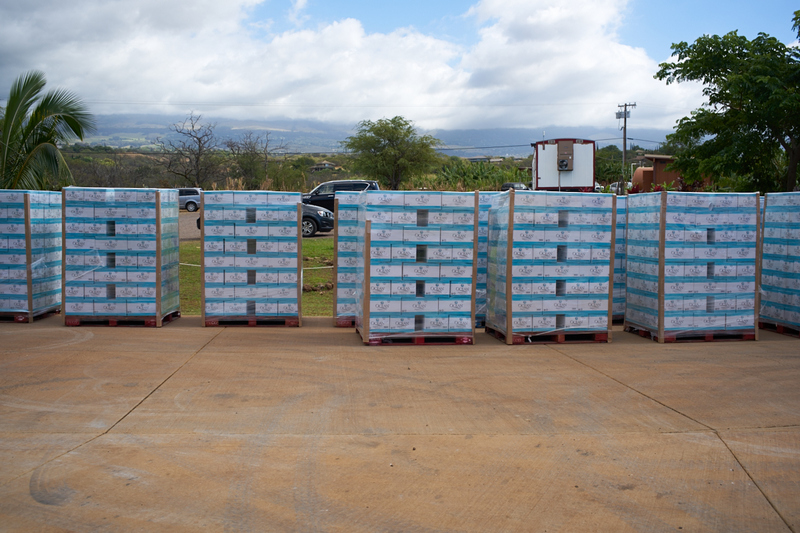 In the yard were many pallets of finished product awaiting loading into a shipping container. The guest reception area was a small structure flanked by huge trees that looked like mesquite but lacked the sharp thorns. The tasting area was an open ramada. 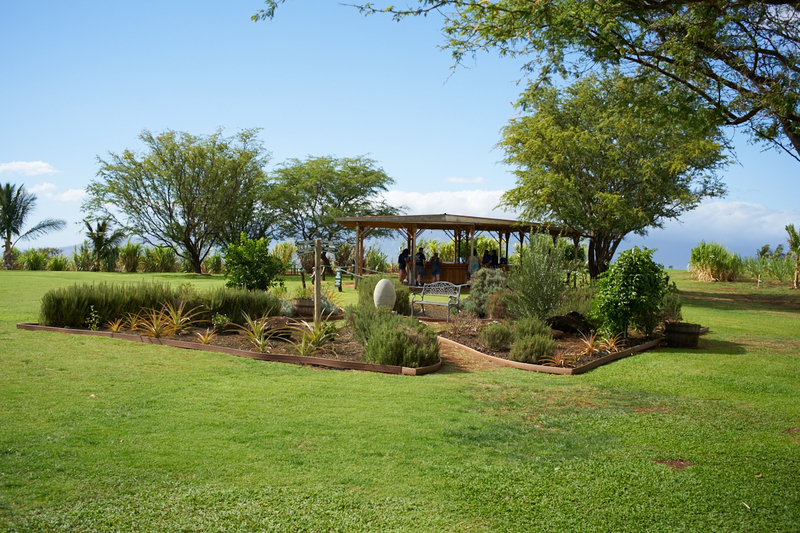 In the foreground are herb gardens used for making exotic martinis. 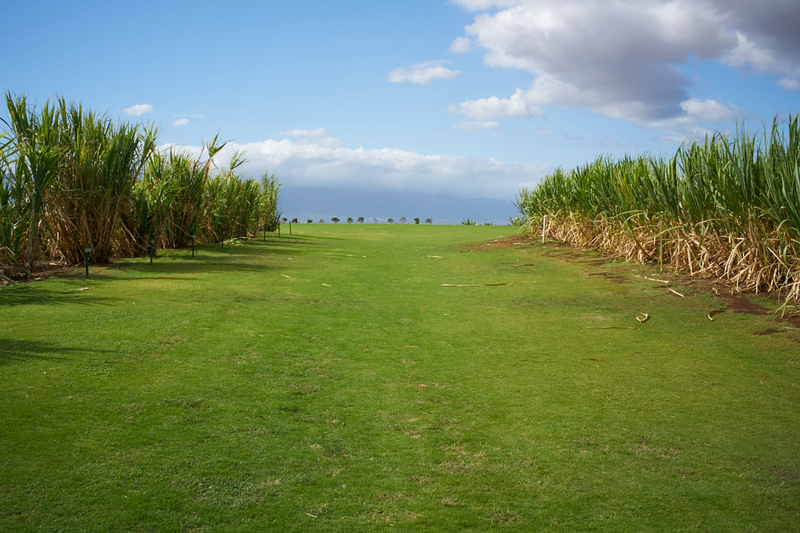 Ocean Distillers grow their own species of sugar cane. 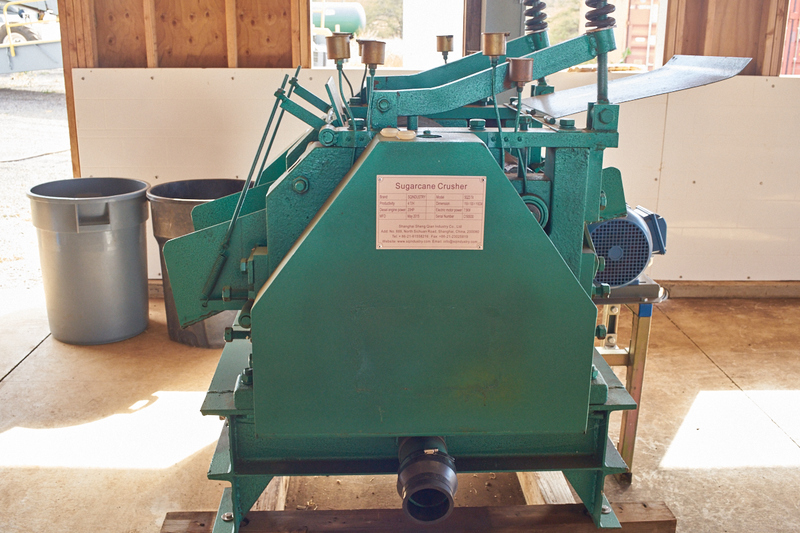 The sugar cane is pressed and crushed in this machine. The juice is output through the black pipe at the bottom. 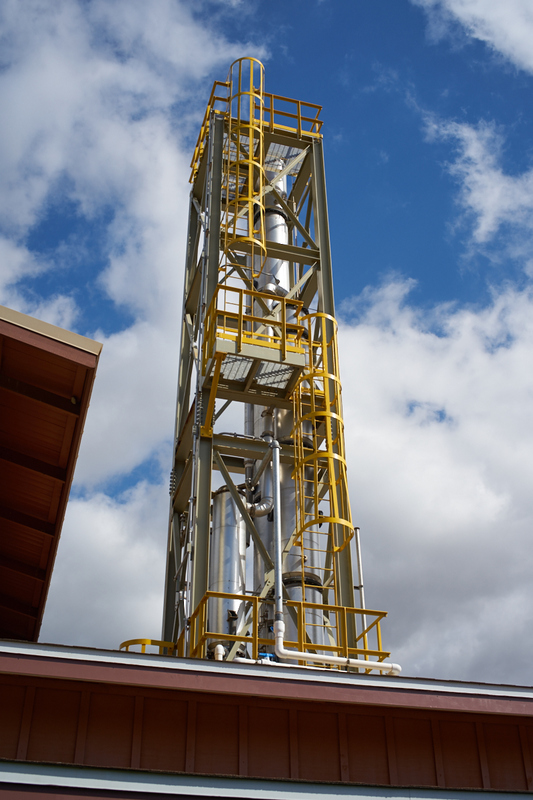 The "cracking tower" for distilling the vodka and rum was clearly visible from the outside of the building. 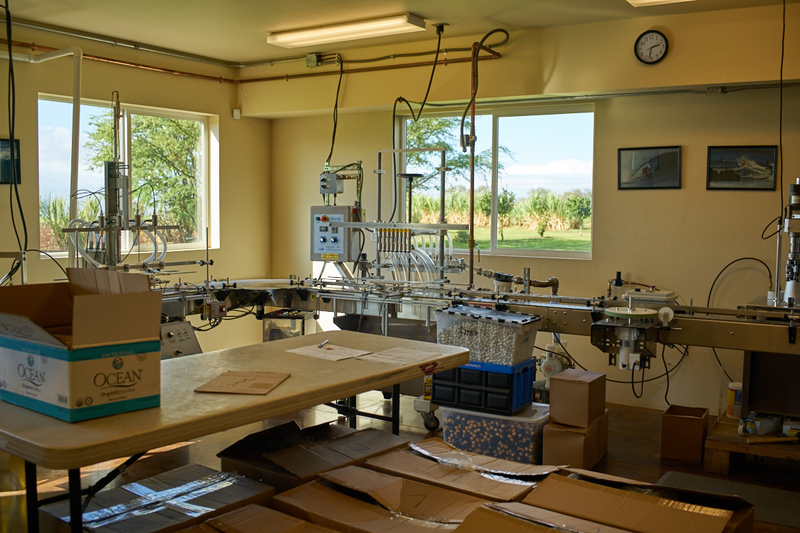 Special water used in the process is shipped in the cardboard boxes. 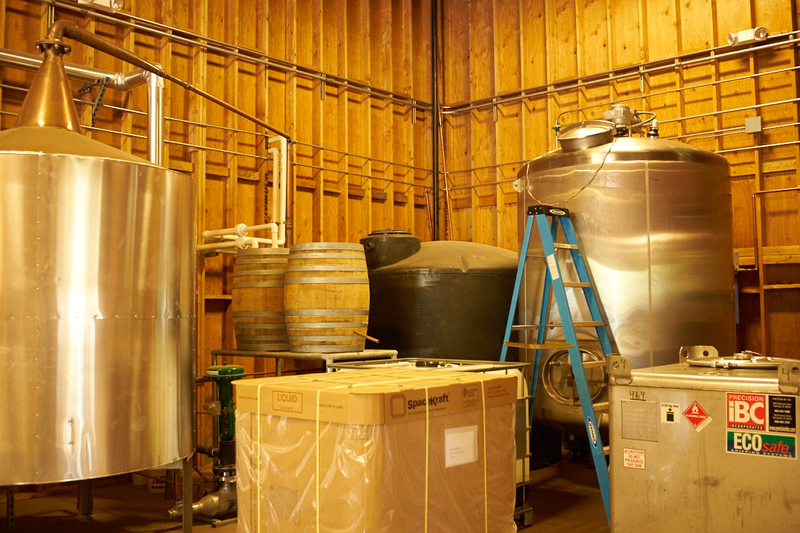 The still is on the left and the condenser for the final product is in the wooden barrels. This small machine bottles all their product. From the distillery at the base of Haleakala we traveled back to Lahaina to Fleetwood's Bar. Fleetwood as in Mick Fleetwood of Fleetwood Mac. Nice enough place, but the bartender was incapable of making a reasonable mojito. I sent it back. 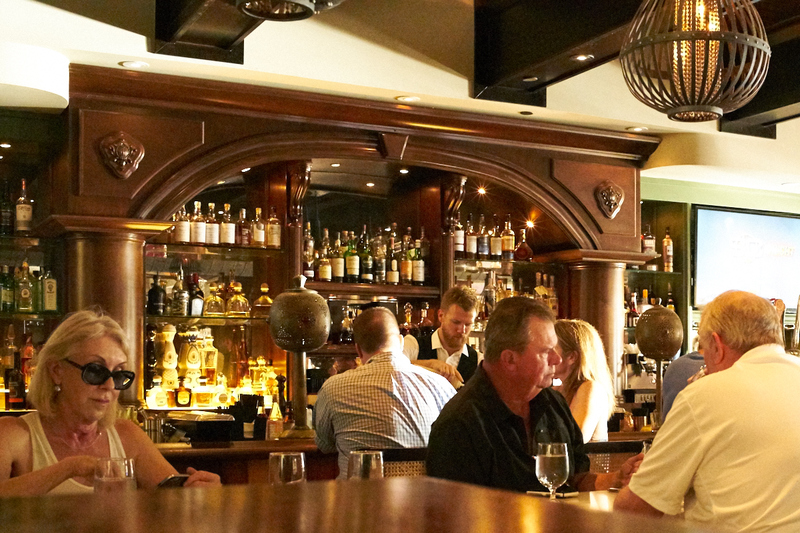 Noisy, crowded, expensive but other than that just another bar on Maui. 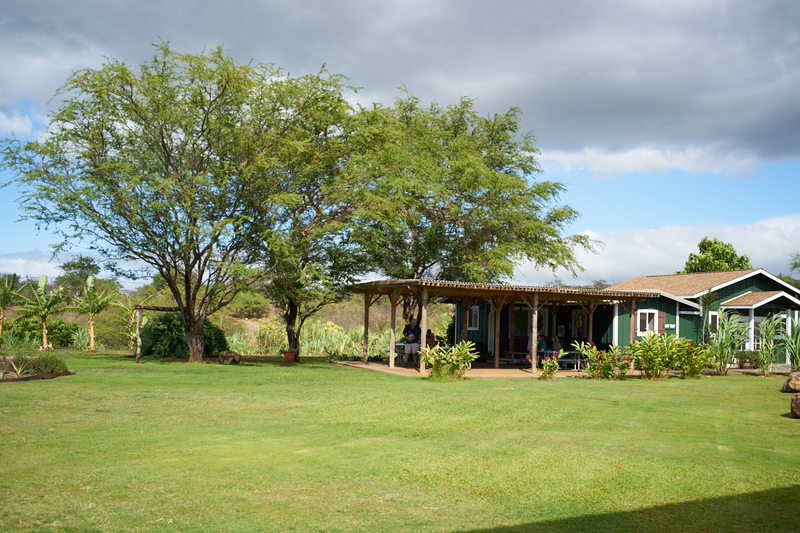 Tomorrow we head to the east side of Maui to a little place called Hana.